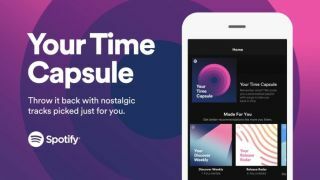 Spotify’s nifty personalized playlists are among the features that still make it a great alternative to the likes of Google Play Music and Apple Music, and the latest one brims with nostalgia appeal. At least, that is, if you’re not currently a teenager. It’s called Your Time Capsule, and activating it pulls up a list of 30 songs from 'your teens and early 20s'. In my case, that means some Offspring and Counting Crows, along with a dash of Collective Soul for good measure. If you’re under 16 then you’re out of luck for a few years, as it won’t even make a list for you. But trust us: make the most of everything else while it lasts. If you want to see what your own list has to offer, just head over to timecapsule.spotify.com and log into your Spotify account. Alternatively, you can find the playlist on the Spotify app for iOS or Android under the Decades section of Browse. Spotify created a similar nostalgia-themed playlist earlier this year called Your Summer Rewind, which pulled up a list of the songs you listened to most in previous summers. To get the best use out of that playlist, naturally, you needed to have been a Spotify user for several years. At the time, we used to to draw attention to the fact that internet-based accounts are constantly tracking your likes, purchases and activity. The Time Capsule, though, is a treat all of us can enjoy. Well, most of us, anyway. Sorry, kids.